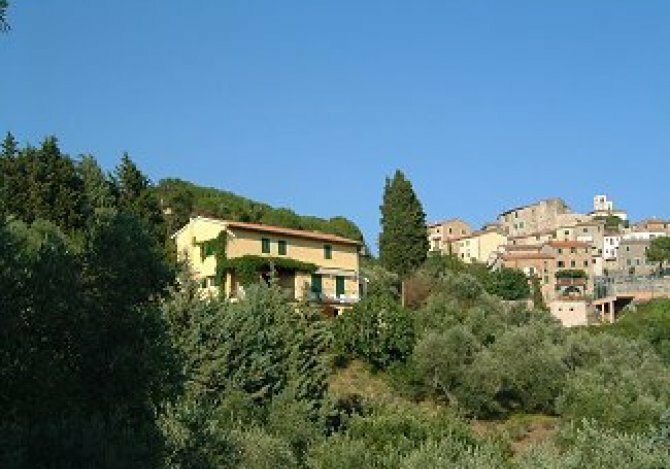 Cancello Rosso, Maremma, Italy, sleeps 8-10 in 4 bedrooms. 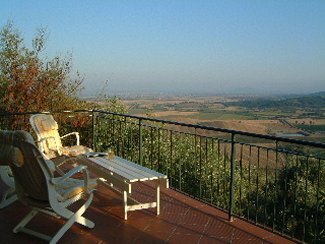 This converted farmhouse is situated just outside the hill village of Giuncarico, one hour south of Pisa and 20 - 30 minutes from fantastic beaches and marina of Punta Ala and of Castiglione. 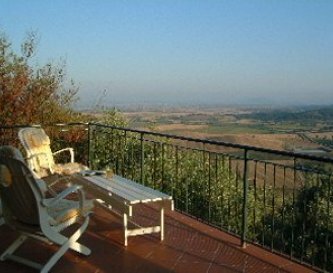 Commanding panoramic views over the Maremma plains and Tuscan hills, it is the perfect base to explore both Tuscany and the coast. 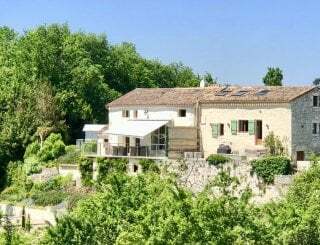 Alternatively with its stunningly situated pool in the olive groves below the house it is the place to chill, eat pasta, drink wine and enjoy the sunshine. 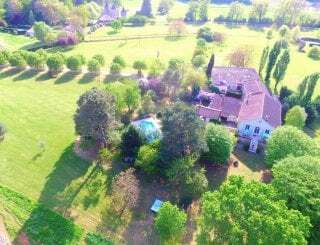 The house will sleep ten in four bedrooms, has three bathrooms, a well designed kitchen, dining hall, sitting room, and two south facing terraces. It has been decorated in simple Italian style with terracotta roofing and tiles keeping the house cool throughout the day. The top floor has two bedrooms which have three beds each - there is a shared bathroom between these two bedrooms. The ground floor has the living space, dining area and sitting room, along with stunning south facing terrace. The lower ground floor has one double room with bathroom with shower over bath; and a double room with bathroom en suite with shower over. A shady lower terrace is accessed from these two bedrooms. There is an additional small bedroom that can only be accessed from the outside and that we sometimes use for au-pairs - it is perfectly comfortable, but not luxury! Apparently there are 68 steps down through the olive grove to the pools. The garden is not manicured but full of plumbago, oleander, rosemary, shrubs, fig trees and sometimes wild boar and definitely tortoises. Well equipped kitchen with everything you should need to cook up an Italian storm. Very large American fridge. The indoor dining table will seat up to 10, but we hope you will never need to use it! Just in case any of your guests want to be inside, which we find unlikely, there is a comfortable salotto with comfortable sofas and an open fire. When we go to this property it is for a total switch off - hence no TV and no broadband. There is stereo with iPod dock. Dongles available nearby. Telephone in the property, but no broadband. Central heating and open fire for winter guests. Logs and heating oil payable locally. Four bedrooms - 2 doubles with ensuite; 2 triples sharing a bathroom. Perfect for two families - kids upstairs, adults downstairs! Cotton linen supplied, and beds made up as requested. Bathtowels supplied, but please bring your own beach towels. Bathrooms tiled throughout and each with their own large immersion heater. Idiosyncratic plumbing, but hot water always available! 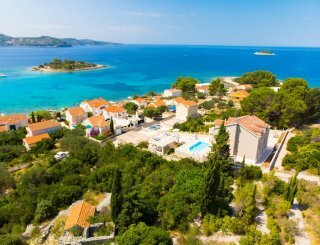 This property is not suitable for disabled on account of it being on a hillside and the number of stairs and steps down to pool etc. No additional children's facilities. There is an old travel cot, but no linen. Stair-gates provided. We have taken our children since babies! Outdoor terraces, seating, dining spaces, pool, olive groves and more. Unheated outdoor pool which is usually at a temperature of between 28 and 31. 10 metres long and 4.5 metres wide with a deep and shallow end. Room for plenty of cars at the property and if necessary on the road above. Smoking permitted outside, but please be very careful where you throw your buts. Forest fires very prevalent in hot dry weather. Pets allowed, but please clean up after them! Maremma area of Italy just on the outskirts of small hill village of Giuncarico. Use satellite view on Google to see location and swimming pool. 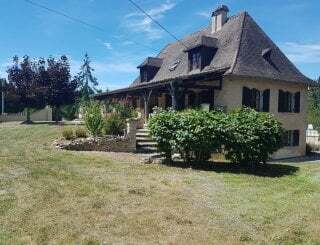 Small Co-op in the village - 2 minute drive. Large supermarkets in Bagno and Ribolla - both 15 minute drive. July and August - £2200/wk. Pisa - 1 hour 20 minutes - main road. Rome - 2 hours. Florence - 2 hours.